5793 labyrinths found. Showing 1981-2000. Sorted by country, state, city, then zip/postal code. Lit at night. 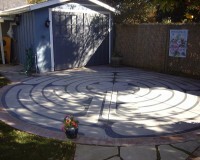 There is also a table labyrinth for the sight impaired. Church is at corner of Geary @ 7th Ave. Enter through garden gate which is on Geary between church and old green parsonage. Outdoor. Gravel paths. Also contains a butterfly habitat. Mon-Sat: 8:30 am-5:00 pm; Sun: 10:00 am-4:00 pm. When garden gate is open. Also have walks for equinoxes and solstices. From Point Lobos where the USS San Francisco Ship Memorial parking lot is, take the Coastal Trail towards the GG Bridge. 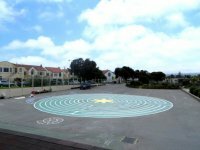 When you find the steps going to the Mile Rock Beach go down and on the cliff next to the beach you will find an 11 circuit labyrinth. It has incredible views of the GG Bridge, Marin Headlands, portions of the Bay and the Pacific Ocean as well as the sunset. 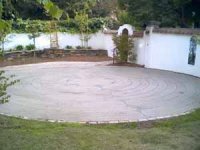 PLEASE NOTE: following its destruction in July 2013, the Land's End Labyrinth was rebuilt in October 2013. Lawton St. is five blocks south of Golden Gate Park off 19th Avenue. Go west on Lawton towards the ocean. The playground is on the left many blocks from 19th Avenue. Look for a large gymnasium. 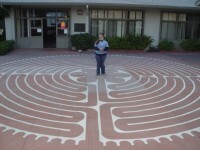 Note that the Labyrinth is not available when classes are in session. Weekends and evenings are open to public. Thanks to Lisa Moriarty for the image at Unity Village. This labyrinth will happily come to you. 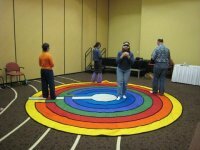 Here is a colorful little Chakra rainbow concentric classical labyrinth with raised fields enabling people to walk it without sight. Walked by people in wheelchairs, danced upon by a theatre troupe, and even enjoyed by quadrupeds. This labyrinth is ready to come to you. Seven circuit Petite Chartres style design painted in three colors. Open during PantheaCon from 2/14 to 2/28/2019. Probably set up next year as well. On the patio behind Room 253. To open Friday, April 14, 2006 for Good Friday from noon till 9pm. 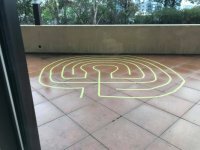 Small seven circuit labyrinth available any time. Tight inner turns are perfect for stopping to reflect and breathe. 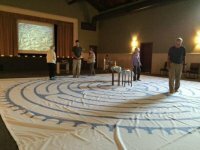 There may be an occasional event such as a wedding scheduled on the labyrinth.